It is my honor to interview the author of coneshell.net, which is a wonderful cone shell database, in its' 10th anniversary on the web, congratulations! 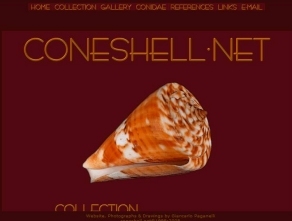 My seashell-collector site was launched one year later. Many thanks. 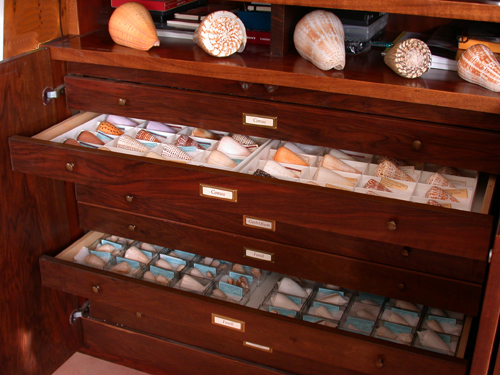 However the honour is mine to be interviewed by an experienced self cone shells (not only) collector and author of the most impressive portal of seashells on the net. May I start this interview with some basic questions? When did you start collecting shells, and what influenced you to start this hobby ? I have always been interested in nature. 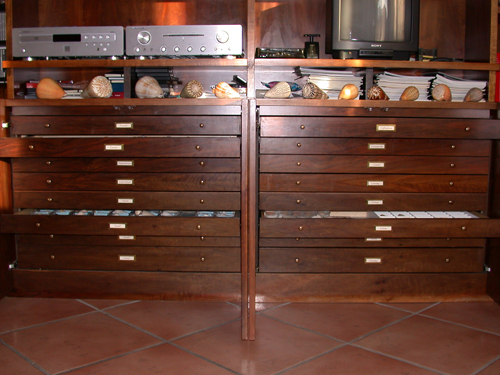 I started collecting shells about forty years ago, chiefly fossil shells in the field. Cone shells in particular about twenty four years ago. I am currently interested in cone shells only, since because of the great number of species and the wide intraspecific variability it is hard having a sufficient knowledge even of one Family. I also collected oliva shells in the past. 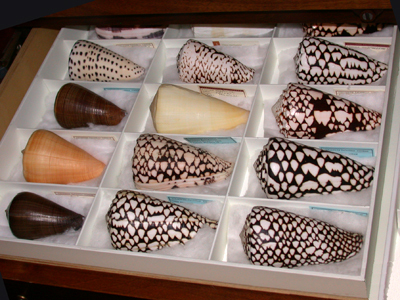 If cone shells have always been your interest, what is the attraction they hold for you, and which family captured your interest and enticed you to start collecting ? In 1984 I was on a school trip and in a little shop I saw a beautiful shell. I was attracted by the shape and the colour pattern of a plane thalassiarchus and I decided I liked that Family. Since then I have tried to get other specimens. Near my town I met a shell dealer from whom I bought my first cones (when I became more expert I noticed that many had filed lip). What was your inspiration in launching coneshell.net? About ten years ago a friend of mine made his website and encouraged me to do the same. 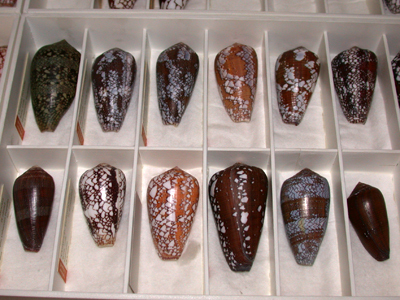 I thought that sharing my small cone collection, at that time about 200 specimens only, was a good opportunity. Are you the primary webmaster, or do you have others that aid you with your website? Yes, I have built the website myself changing the layout many times and trying to improve its look and affordability. The pictures have good quality, how do you make them ? I started using a reflex film camera and scanning the images I got, later only scanning. At present I use a digital compact camera fixed on stand and two white halogen 150 watt lamps. 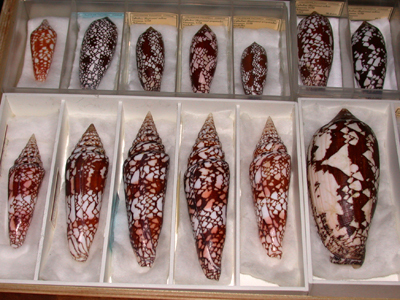 How many cone shell specimens are now hosted by your database ? In my collection I have currently about 3,700 cones, 200 of which are fossil. 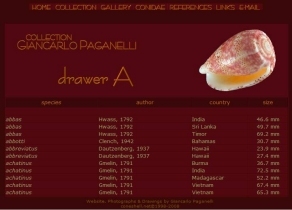 Over 1,900 different specimens are on line. I wish it were so!!! I got the greater part by internet, exchanging or at Shell Exhibitions. Only a few I collected myself in the Ionian Sea or at Unguja Island. Unfortunately I had no many opportunities to visit my favourite destinations. Now that I'm retired I intend to visit some dream places such as the Caribbean Islands , Thailand, Seychelles and so on. Have you found any rare species? 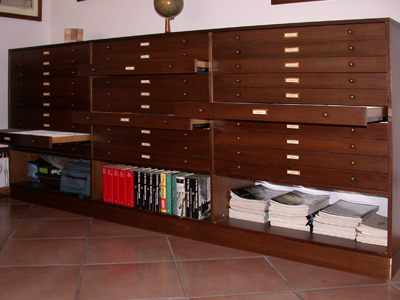 The rarest I have are adamsonii, atlanticoselvagem, capreolus, cervus, excelsus, gauguini, immelmani, martensi, stupa, stupella, swainsoni and others. But I need about 50 species very difficult to find or too expensive to buy. 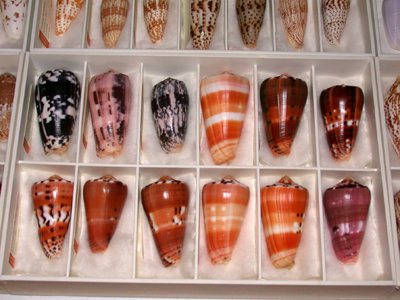 Would you tell us what are your ten favorite cone shells and why ? I know it is always very difficult to choose ! There are some species I like better because of their intraspecif variability, attractive colour pattern and peculiar shape, pennaceus in primis; then, in alphabetic order, archon, aurisiacus, barthelemyi, cedonulli, chytreus, gubernator, mercator, milneedwardsi, spurius. But not necessarily are they the top ten. 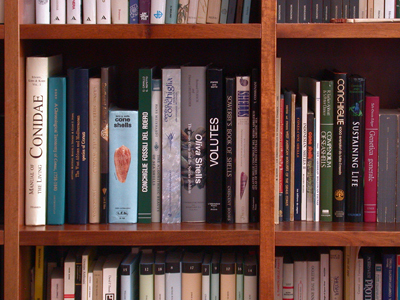 What reference books do you regularly use concerning cone shells ? 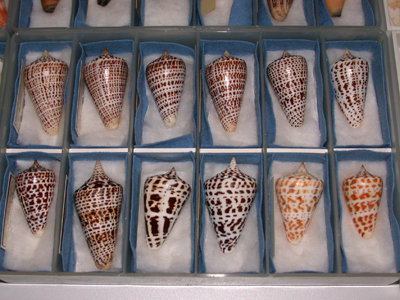 Of course The Manual Of The Living Conidae and West African And Mediterranean Species Of Conus, but also A Chronological Taxonomy Of Conus, Cone Shells A Synopsis Of The Living Conidae, The Conidae Of The Western Atlantic (La Conchiglia) and several other books and journals. Do you think that the present literature is sufficent on cone shells, or is there a need for additional books? I know that Pr. 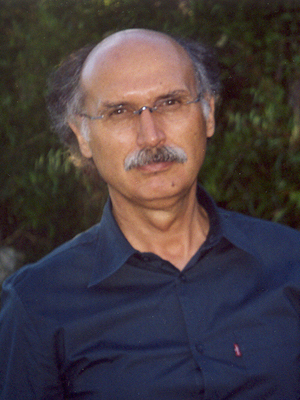 George Richard is working on a worldwide cone shell related book, and that Dr. Khon is working on a project as well . I guess you can't wait to use them ? Maybe you have more infos on some upcoming litterature ? Unfortunately, except West African…, many publications are dated (The Manual was published 13 years ago). 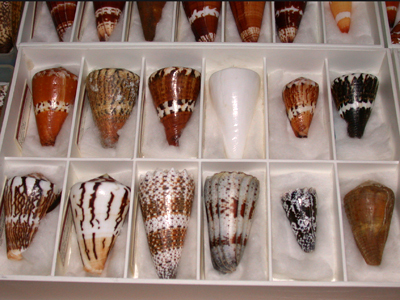 I am missing an updated and systematic revision of worldwide Cone Shells. If the book by Richard goes in this direction, it will be welcome. Dr. Alan Kohn has recently told me that he is working on a revision of West Atlantic Conidae, initially only on print version. Moreover, an iconography of South African Cones by Monteiro & Tenorio is due to come before long.